Eggs are a power-food and everyone knows it. 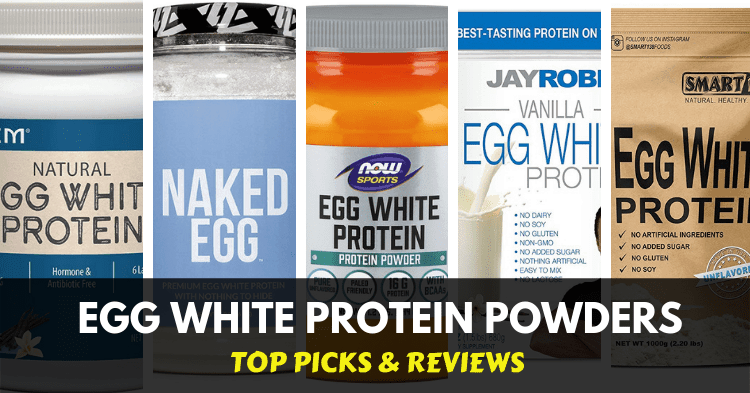 They’re one of the most well-regarded fitness foods and – while you don’t have to drink them raw like Rocky – an egg white protein powder drink is a great choice. The best egg protein powder is the one that provides the benefits of eggs with the best protein content, price, taste, and overall cost/ benefit profile. So, without any further ado, here are our favorite products on the market, and why we love them! Why Use Egg Protein Powder? 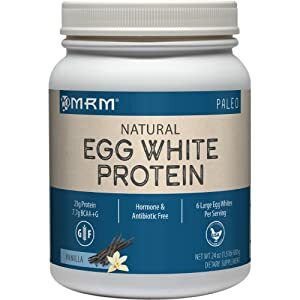 The MRM natural egg white protein is no more or less effective than any other egg white protein powder on the market. The protein content is weaker than some, but comparable to whey and other powders. 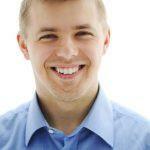 Rather, MRM attempts to sell the product on transparency and an approach to production that is responsible. They aim for organic (which really doesn’t matter), ethical farming and trade practices (which definitely may be important to you). The result is a product that is more expensive than many other alternatives on the market, with very little nutritional difference to show for it. There are ethical reasons to choose this product, but from a performance and nutrition standpoint, it doesn’t do anything special. This is a simple egg white protein powder, but less effective than many and more expensive than most. If you’re committed to these ethical practices, it’s a great choice, but if not then it offers absolutely nothing outstanding. With a plethora of flavors and a competitive 24g of protein per serving, this is a product that starts off with the right focus. 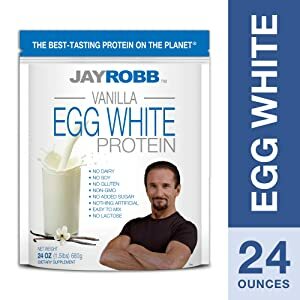 Egg proteins can taste weird to those familiar with whey, but Jay Robb’s egg protein powder seems to have taken this on-board and put some focus into taste. They use a healthy dose of zero-calorie, indigestible sweeteners to achieve this, meaning a low sugar content. So, if you’re scared of artificial/GMO foods, or you’re allergic to any of these compounds, it’s a great place to get your protein from! 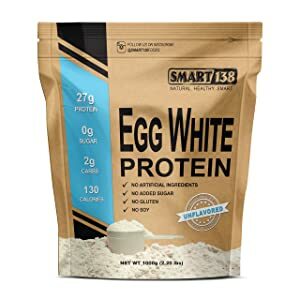 Overall, this isn’t a stand-out product: it does the bare minimum to make for a good egg white protein powder, but it is a good standard to have. The only problem is that it is ridiculously expensive (the cost of being associated with Jay Robb’s scientifically-ignorant brand!). Bulk Supplements’ whole approach to supplements is this: simple, effective, great value. This is exactly what you can expect of their egg white-based “paleo” protein powder. Fortunately, this paleo protein powder is far more effective and reasonable than the paleo diet itself. It provides 25g of protein per serving (around a gram more than most of the high-quality whey protein powders on the market), without any added sugar, soy, milk, yeast, or additives. This makes it a 100% pure egg white protein powder at a great price – and avoids many of the hidden ingredients you simply don’t need. This lack of other ingredients does lead to a “distinctive” taste, but you can easily control the taste by combining with other products, or simply mixing it with the appropriate foods/liquids. 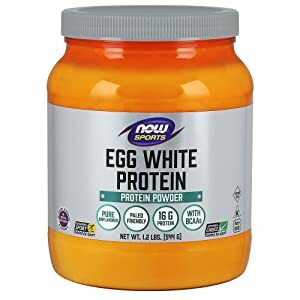 This is a great product for complete control over your diet, with both the benefits and drawbacks of a minimalist approach to egg white protein powder. This product is off to a great start with a competitive 27g of protein per serving – the servings are 10% bigger than the products we’ve discussed so far, but that’s not a huge problem since it comes at a reasonable price. This is a totally un-sweetened product, either by sugar or sweetener, so you should be expecting it to taste relatively similar to egg whites. This is a bit less appealing than other products which provide sweetness. You can get different flavors, but even the chocolate flavor has 0 sugar and instead uses natural cocoa as a way of providing flavor. We actually really like this approach, since many protein powders taste awful when sweetened. This might be a normal product in every other regard, but subtle flavoring gives you the chance to play with shake recipes without the distinctly-chemical taste! If you’ve read any of our reviews before, you’ll know we’re big fans of naked and their supplements. They balance a no-nonsense approach to dietary supplements with the effective, scientifically-proven ingredients. Naked also provide 25g of protein per serving, with a much lower sodium content than other products on the list so far. Usually, you’d expect 25% of your daily sodium, but naked is only 16% – a marked improvement. Sodium can be useful, but you should be limiting your intake and balancing it with potassium intake – which naked actually provides 9% of your daily intake. This is a fantastic way to avoid excessive water retention and keep your minerals balanced! Overall, Naked continue to impress by focusing on what actually matters. The serving size for NOW sports is deceptive: it makes it look like it is going to be a low-sodium product but, in reality, you’re just eating 2/3 of the regular serving size. The product itself is relatively uncompelling: 24g of protein per 30g, with a very-normal 24-25% of your daily sodium. The potassium content is also relatively low, so we’re already leaning away from this product for the health effects. 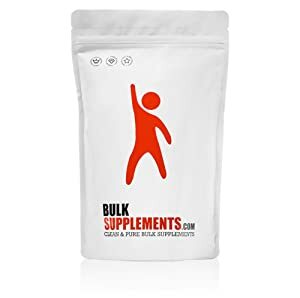 This product isn’t bad – it’s just very much the same as we’ve seen before – it’s no different to the bulk supplements powder, just with a much higher price point. From a customer’s perspective, it’s hard to see why you’d choose this product. The protein and other nutritional information for this product is exactly what you’d expect if you’ve been paying attention through these product reviews. That’s because, famously, “eggs is eggs” – there’s not much variety to be found. For these two reasons – and the fact that they are neither particularly good or bad compared to other products on the basics – we quite like this product. Some people have noted a concern with the mixability of this product, which is a common concern for egg proteins. They’re foaming by chemistry, so you may want to really increase your fluid-use compared to a whey protein. There are also some less-brilliant flavors, with concerns raised about the espresso flavor and pumpkin pie flavors. On the other hand, there are lots of positive responses about glazed donut – so be sure to check reviews for each flavor individually! 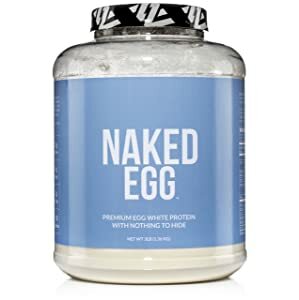 The sodium and potassium balance is also even better than naked’s, making this the favorite and best egg white protein powder on this list! 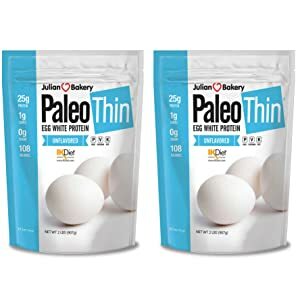 Egg protein mixability tends to be poor, Paleo Thin is no exception! If you’ve gotten to this article, you’re probably interested in egg white protein powders and what they can do for you. The benefits are pretty great, and we’re going to outline the big ones that should be affecting your decisions. Obviously, people out there are allergic to eggs and shouldn’t use this product. Egg proteins are naturally some of the most bioavailable and readily-absorbed. They’re high-affinity for humans, since they’re designed to be used for a variety of purposes in eggs themselves. This is great, since many other types of dairy- or soy-based proteins tend to have poor digestion, while many other plant proteins are incomplete. A more bioavailable and high-affinity protein powder are going to bring the best results for every gram you put in your body. This makes for a great protein powder, and a wholefood-based protein powder. By calorie, egg white protein powders are some of the leanest protein powders around. This is even more accurate when we talk about the products above that are sweetened with zero-calorie, indigestible sugar-alcohols. Obviously, the protein powders that are totally unsweetened tend to have a great calorie-balance. These are great for high-protein weight-loss diets, as it improves muscle-sparing, helps you build muscle, and supports weight loss. The natural comparison you’ll want to make is between egg protein powders and whey protein. Whey protein is the #1 protein powder on the market, but it isn’t necessarily the best. To start with, egg proteins are going to be more expensive. This is the result of being made of a more expensive product, and also the fact that the market isn’t as deep. If millions of people were buying egg protein, they’d be able to make it cheaper, like whey. However, if you ignore the cost, egg proteins almost always beat whey proteins. The amount of protein in a single serving is higher (usually 25g) than in whey, and there’s no lactose. These combine to form a picture of a supplement that is both more inclusive and more effective than the milk-based alternative. The only time whey is a more effective alternative is, arguably, as a post-workout nutrition supplement. This is because it is fast-absorbing, though chugging huge amounts of whey post-workout can be a real challenge to your digestive health and many people experience problems with it. We love egg white protein powders. They provide some of the purest, leanest protein supplements on the market. You’re going to have a different experience with egg protein powders – the market isn’t quite as big yet, and they’re still under development for many supplement companies. However, the products we’ve reviewed today provide a great picture of the two different types you can expect. First, we have the overall best egg white protein powder: the Paleo Thin powder. The branding and name of this product are silly, but the results certainly aren’t – it provides a lean, fibrous, delicious alternative and shows real promise for the direction of the egg protein powder market. On the other hand, Bulk supplements provide a fantastically simple, minimalist approach to egg powder. This incorporates a pure egg protein powder with no fuss, no additives, and a great price point. Which one should you choose? Well, that depends what you want to do with it. If you’re having it in a shake, we recommend the Paleo Thin powder since it has better taste and a well-rounded nutritional profile. However, if you’re making a DIY protein shake with your own choice of flavors and other ingredients, the bulk supplements powder is a great choice.